Grand Canyon National Park celebrates its centennial season this year, and the nation’s second most popular national park is expected to draw a record number of visitors — a figure that could top 6.5 million. So, if you’d like to join the 100th birthday celebration for the majestic canyon’s national park, we’d strongly suggest you beat the crowds with a winter visit. 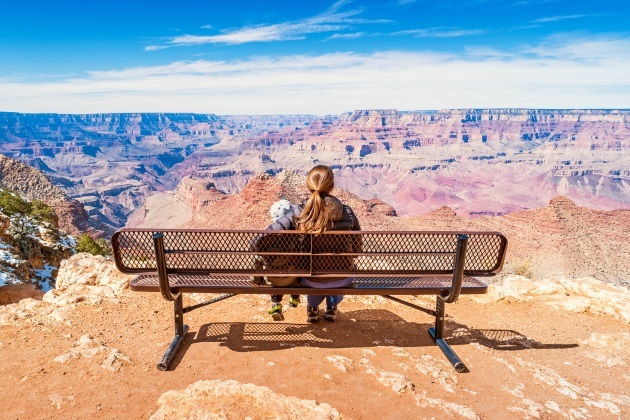 While the canyon’s North Rim closes to the public during the winter, the South Rim remains open, and the park’s scenic drives, viewpoints, trails, lodgings and RV campgrounds are delightfully uncongested. At an average elevation of 7,000 feet, the South Rim’s winter daytime temperatures can, of course, can be on the chilly side (typically 40-50 degrees Fahrenheit) but conditions are usually ideal for canyon gazing; hiking; biking; and mule, horse and helicopter rides. Although infrequent, dramatic winter storms can bring several inches of snow, they are generally followed by sunny days, perfect for walking along the rim or into the canyon along Bright Angel Trail. Crisp air and a dusting of snow bring a new perspective to the multicolored sandstone temples and buttes emerging from the 6,000-foot-deep canyon floor and provide a splendid backdrop for viewing the canyon’s flora and fauna. Mule deer, elk, Albert and Kaibab tree squirrels, bald eagles, California condors and ravens are just some of the wildlife that can be spotted during the winter. A pair of in-park campgrounds host RVers year-round. Mather Campground, managed by the National Park Service, keeps its Sage and Pine loops open all winter. From March through November, the campground accepts reservations up to six months in advance at www.recreation.gov, while sites are available the rest of the year on a first-come, first-served basis. Mather Campground doesn’t have hookups and limits RV length to 30 feet, but neighboring Trailer Village RV Park provides full-hookup sites up for rigs up to 50 feet. The park takes year-round reservations up to 12 months in advance at www.visitgrandcanyon.com. From either campground, the paved Village Greenway trail leads to the Grand Canyon Visitor Center, where a 20-minute film and interactive exhibits offer a compelling introduction to the park. The Village Greenway continues on to the South Rim with its many miles of paved walking and biking trails — all offering spectacular views. RVers choosing to camp outside the park will find a number of commercial parks near Interstate 40 and in the town of Williams, Arizona, about an hour’s drive south of the canyon. For a truly unique experience, visitors can hop aboard the Grand Canyon Railway (www.thetrain.com) in Williams and enjoy a day-trip to the park aboard a train composed of vintage locomotives and 1920s Pullman coaches. Currently on offer is an attractively priced Winter Getaway Package, including round-trip train transportation plus lodging and meals at the Grand Canyon Railway Hotel in Williams. For those seeking lodging in the park, there are several possibilities, topped by the legendary 1905 El Tovar Hotel, ideally located directly on the canyon rim. Four other South Rim lodges — Bright Angel, Kachina, Thunderbird and Maswik — are open all winter as well. For reservations, see www.grandcanyonlodges.com.